Kia's best-selling minivan has been updated with a slew of subtle yet significant upgrades. Turns out the all-new K900 flagship sedan wasn’t the only model reveal from Kia at the New York Auto Show. Also making its debut at the Big Apple is the refreshed 2019 , arriving with bold new styling, a more spacious cabin, and new tech. Its newly designed front and rear fascias mirror the design language utilized on newer Kia models, with more modern LED headlights that come as standard SX and SXL trims flanking Kia’s signature ‘tiger nose’ grille highlighted with a detailed mesh-like pattern. A restyled bumper and air intake give the minivan a sportier appearance, while rear combination lamps flank the restyled chrome garnish on the liftgate. For convenience, a new power sliding door button has been added to the door handles on EX trims and above, providing easier access to the cabin. 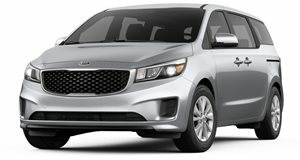 “While the Sedona has continued to redefine and revolutionize the minivan segment with its bold design, advanced convenience features and upscale cabin, a subtle facelift and extended tech roster help keep our most functional multi-purpose vehicle fresh and relevant,” said Orth Hedrick, Vice President of Product Planning at Kia Motors America. “The enhancements that come as part of the new model year are sure to continue raising the Sedona’s appeal and desirability.” The facelifted minivan also features reduced front rear and overhangs and a choice of newly designed 17-, 18-, and 19-inch wheels depending on the trim. For the new 2019 model, the Sedona’s interior has been further refined with a more modern center fascia complete with new graphics in the instrument cluster. The floor console between the front seats now features an available wireless charger and sunglasses holder while an electronic parking brake is standard on SX and SXL trims. An available USB charge point has been added to the luggage area and Rear Entertainment System is also available to o, which adds 10.1-inch dual touchscreens located on the back of the front seats with smartphone-mirroring functionality and internet access to entertain rear passengers. Other premium options include a Harman Kardon premium audio system, wood grain trim on the front door panels, an LED mood lamp, and the choice between an available single or dual sunroof. A new Driver Attention Warning system has been added to the long list of driver assists, which alerts the driver and automatically applies the brakes if the system detects any wanes in concentration. Other assists include Forward Collision Warning, Smart Cruise Control with Stop & Go, Rear Cross Traffic Collision Warning, Blind Spot Collision Warning and Forward Collision-Avoidance Assist. Like last year's model, power for the 2019 Sodena is provided by a direct injection 3.3-liter V6 delivering 276 horsepower and 248 lb-ft. of torque. Its power figures haven’t changed since the last model, but an eight-speed automatic transmission replaces the six-speed automatic in the outgoing model providing a smoother driving experience and improved fuel economy. Five trim levels will be available: L, LX, EX, EX Premium, SX, and SXL. The top SXL trim includes a unique bumper, skid plate LED headlamps and foglights, 19-inch chrome wheels and a distinctive side sill. Pricing will be announced closer to the 2019 Sedona’s sale date, which has yet to be announced.